The Highlands Chaplain is a priest of the Legion of Christ who serves the entire school community by fostering in all a friendship with Christ and life of grace. Our chaplain focuses especially on making the Sacraments of Reconciliation and the Eucharist available on a regular and frequent basis. In addition, the Chaplaincy endeavors to be present to the spiritual needs of those in The Highlands community and to support the many spiritual and apostolic initiatives that arise in nearly every department and area of the school. The chaplain, together with the Formation Department joins with school staff, faculty, parents and administrators to provide Integral Formation for the whole Highlands community. Fr Fergal Ó Dúill LC was born in Dublin, Ireland. He is the oldest of 8 children all of whom love Ireland and none of whom live there. He graduated in Mechanical Engineering from University College Dublin and worked for 3 years as a Project Engineer, first in Ireland and then based in Albany, New York. God called him to the Legionaries of Christ in Cheshire, Connecticut in 1993. There, he did his novitiate and studied Latin, Greek and the Liberal Arts. He received his bachelor´s degrees in Philosophy and Theology at the Athenaeum Regina Apostolorum in Rome. In between he did youth and vocation work in Ireland. After ordination to the priesthood on November 25th, 2004 he served for two years in Mexico before returning to Dublin, Ireland to help in the mission with youth and families. 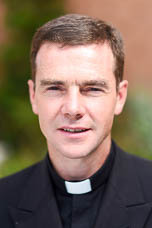 Fr Fergal serves as Chaplain to the Highlands School and to the Regnum Christi Movement in the DFW area. “What I love most about being a priest is seeing the daily miracles of grace that God works in peoples’ hearts and lives”.